A scatter-shot piece of action pulp, Escape Plan is a sluggish ride broken-up with a few cheap thrills along the way. The only hook here is the teaming of genre icons Sylvester Stallone and Arnold Schwarzenegger in full-on buddy mode. It’s thankfully free of fan service, meta-humor, and lofty aspirations, though it does perform a weird flirtation with making a political statement. Stallone plays Ray Breslin, an attorney-turned-professional prison escapee who literally wrote the book on jailbreaks. A pseudo-MacGyver, Breslin has made a career of testing the weak-spots of penitentiaries by busting out of them. Ray is enticed to forego his usual safety protocols to infiltrate and test a new, privately funded black-site facility designed to contain the scumbags of the earth (most of whom, once revealed, seem about as intimating as the inmates in Jailhouse Rock), a super-duper-mega-max structure of plexiglass cells policed by masked guards lead by Vinnie Jones and overseen by a sadistic warden, Hobbes (Jim Caviezel). The deal turns is a double-cross, and Ray is left to rot indefinitely. He quickly befriends fellow inmate Emil Rottmayer (Schwarzenegger), a mobster with coveted knowledge that Hobbes has been hired to obtaining. While they plot the escape of a lifetime — or at least seems to take that long — Ray’s colleagues (Amy Ryan and Curtis “50 Cent” Jackson) attempt to locate him in an aimless, needless sub-plot that accomplishes little. It’s the kind of thing that Arnie and Sly have done for decades — and therein lies the problem. These two action vets seem bound to repeat the past ad nauseum, but then this is what fans have clamored for since The Expendables 2 first united the two on the big screen. The downside to that is these guys are past their prime, and their limitations are beginning to show. They don’t move like they use to, and thus the action scenes are limited and by-the-book. Busting out of an assisted living facility would have been a more appropriate setting; still, we do get a blast from the past when Schwarznegger fires off his trademark glower before going full-auto on a squad of bad guys in the climax. 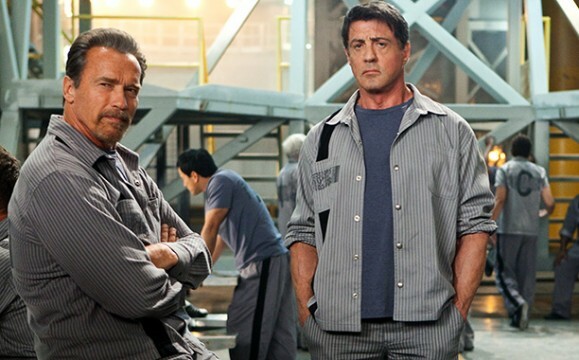 Escape Plan also exhibits a curious left bend for movie starring two pillars of Reagan-era jingoism. Corporate prisons, extraordinary rendition, waterboarding, and Blackwater are called-out, and Muslims are not only treated with respect, they prove to be key allies. These details are handled so mildly however, one is left wondering if it’s merely set dressing for the story or if someone was afraid to alienate the audience — or both. Director Mikael Håfström breaks no new ground while turning out a workmanlike effort. Stallone seems bored, or at least sleepy, much of the time. Schwarzenegger avoids hamming it up, but Caviezel gladly takes up the slack on that end by playing a villain almost as campy and effete as Hannibal Lecter (but without the charm). Vincent D’Onofrio coasts through his role as Breslin’s business partner, with characterization limited to a nasal voice and predilection for hand sanitizer. Ryan is barely utilized as a love interest, which was as probably as much of a relief to her as it is for us. Between the two of them, Stallone and Schwarzenegger have been in dozens of bigger, dumber, louder movies than this, most of which were far more satisfying. My cousin encouraged I would potentially like this internet site. He once was absolutely perfect. This particular post genuinely created my personal working day. You are unable to picture the best way a good deal time frame I had created put in because of this details! Many thanks!